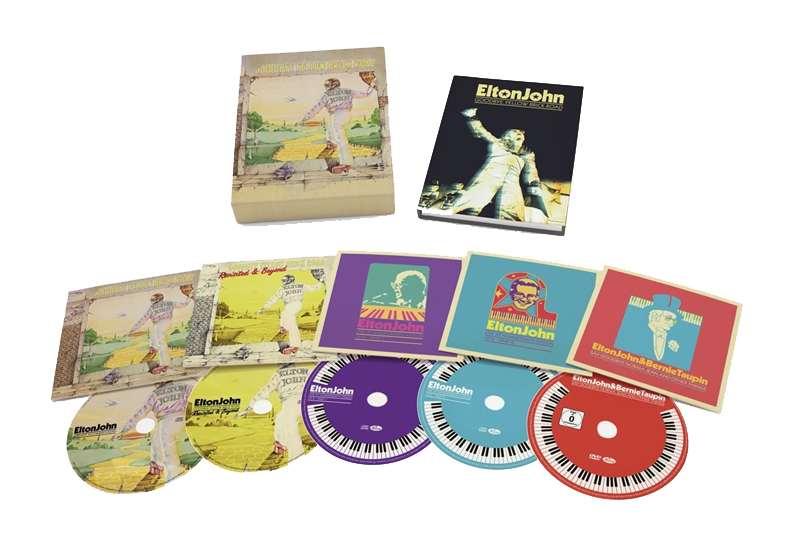 Spin This: "Candle in the Wind," "Funeral for a Friend/Love Lies Bleeding," "Saturday Night's All Right for Fighting," "Grey Seal"
A pompous and ambitious double-LP disc, Goodbye Yellow Brick Road proved to be a historic marker in the career of Elton John. Prior to its arrival, his journey had been sadly confined to singer-songwriter and meddled with Americana-tinged conventions and piano blues. But even with lyricist Bernie Taupin penned to his hip, John wanted more to rise beyond singer-songwriter royalty. Yellow Brick Road gave him the freedoms to experiment with a world of styles ranging from ska (“Jamaica Jerk-Off”) to Beatles-esque baroque pop (“Goodbye Yellow Brick Road”). He dances around with jazz-rock like Chicago and Steely Dan on “Grey Seal” and does fires up the dated ARP synthesizer on the eleven-minute opener “Funeral for a Friend” before segueing into the arena rock majesty of “Love Lies Bleeding” led by the competent drumming of Nigel Olsson and electric guitar wails of Davey Johnstone. He touches Bob Dylan poetry on “Candle in the Wind” by turning Marilyn Monroe into someone embarking martyrdom (“Your candle burned out long before your legend ever did”). Even its unexpected hit, “Benny and the Jets,” shows enough signs of its chart-topping prophecy as it sashays with Roberta Flack/Aretha Franklin piano in a piece done up with sophisticated r&b, even as the corny lyrics scream for all the attention. At the time of its release, critics were particularly hung on the fence of John’s experimental detour (Rolling Stone claimed it to be unorganized and said it was “big fruity pie that simply doesn’t bake.”). But critics hardly know greatness when they first hear it. Give them time; they’ll come along. Yellow Brick Road is episodic and easy-flowing, ripe with though-provoking intermissions (“Candle in the Wind,” “I’ve Seen That Movie Too,” “This Song Has No Title”) and stellar filler (“The Ballad of Danny Bailey (1909-1934),” “Roy Rogers,” “Harmony”). Forty years later, Goodbye Yellow Brick Road beams like a classic record and never sounds dusty. Even with four decades behind its debut, Goodbye shows no signs of drifting away from contemporary music. So the idea of bringing modern contemporary singers and performers aboard the second disc of John’s massive box set seems like an appropriate strategic move, one that will introduce youngsters to John’s magnum opus. They will certainly like the r&b grooves now encircling Hunter Hayes’s take of the title track and enjoy the trippy mellow down brushes on Emeli Sandé’s version. They’ll even blush at Ed Sheeran’s country-tinged modifications on “Candle in the Wind.” But most of these revisions – although done with heart – seem to pale against John’s originals. Fall Out Boy’s crudely loud “Saturday Night’s Alright for Fighting” warrants the fast-forward button, especially when they introduce the catchy bridge way too early in the song. The Band Perry’s banjo-heavy showcase on “Grey Seal” isn’t as irritating as Miguel’s muscle-flexing “Bennie and the Jets,” but it’s in the same ball park of mundane re-productions. Thankfully, the box set returns to John’s flamboyant ego strokes by incorporating an interesting piano demo of “Grey Seal,” the gorgeous, but blatantly-offensive non-album B-side of “Goodbye Yellow Brick Road” (“Screw You”), Christmas gems from 1973 (“Step into Christmas”) and other studio artifacts. The third and fourth discs of the set focuses on the BBC live taping of his December 22, 1973 gig at Hammersmith Odeon, something relics have only enjoyed previously in bootleg forms. A forty five-minute companion documentary directed by the late Bryan Forbes and a mind-blowing 100-page miniature coffee table book closes out the set with majestic style. All these delicious additions inside John’s supersized Yellow Brick Road collection makes any of the album’s slip-ups seem so distant. It’s enough to make Dorothy and her friends from Oz camp out here.